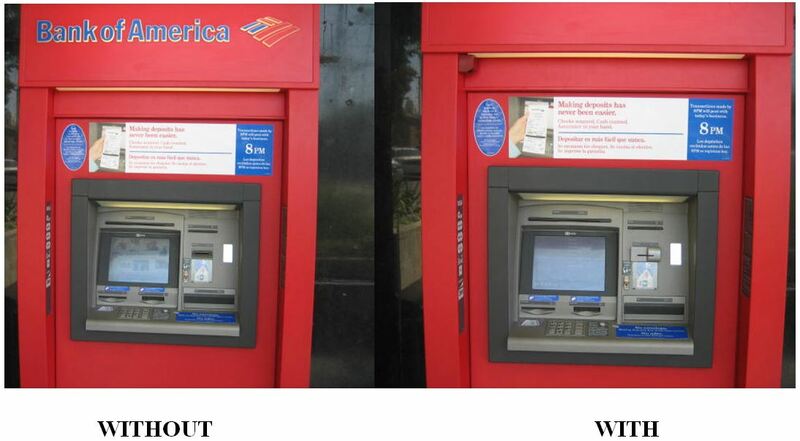 An ATM (automated teller machine) is one of the most convenient ways to receive and deposit cash on the spot! That said, they’ve also become a fun park for hackers. Here are 20 ways hackers may be able to steal your bank information. Scammers and hackers will make fake card insert modules that will grab your credit or debit card information. This technique is called “skimming”. 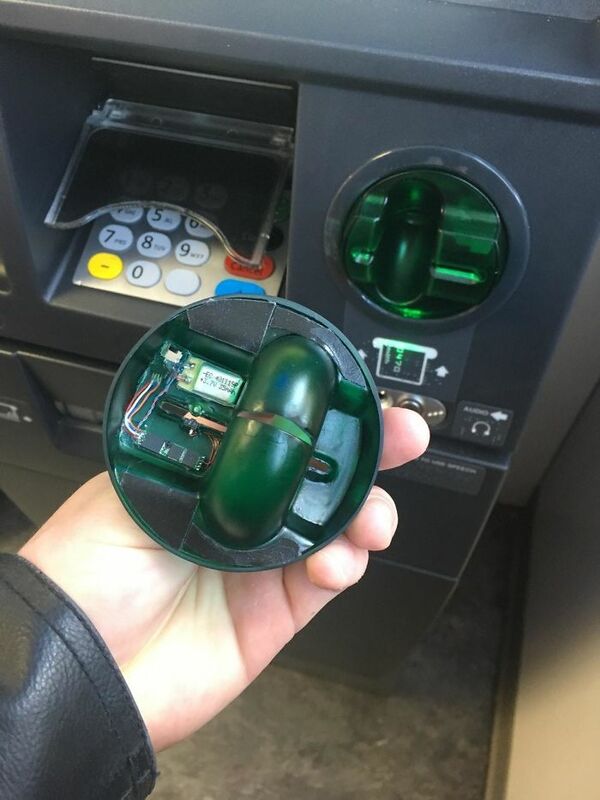 This act is used to install homemade devices into bank ATMs to steal user’s information like banking information and PIN numbers. 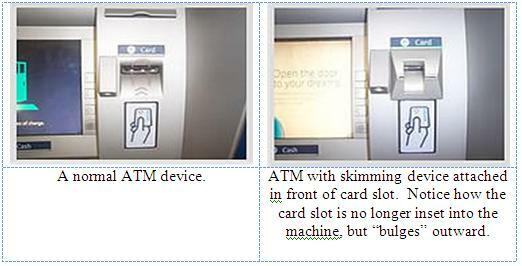 There are many different types of skimming devices scammers can use. Sometimes these can be hard to spot. Often times you can spot a fake card reader by the way it is shaped. This one for example has one end jutting out, instead of being a straight line. 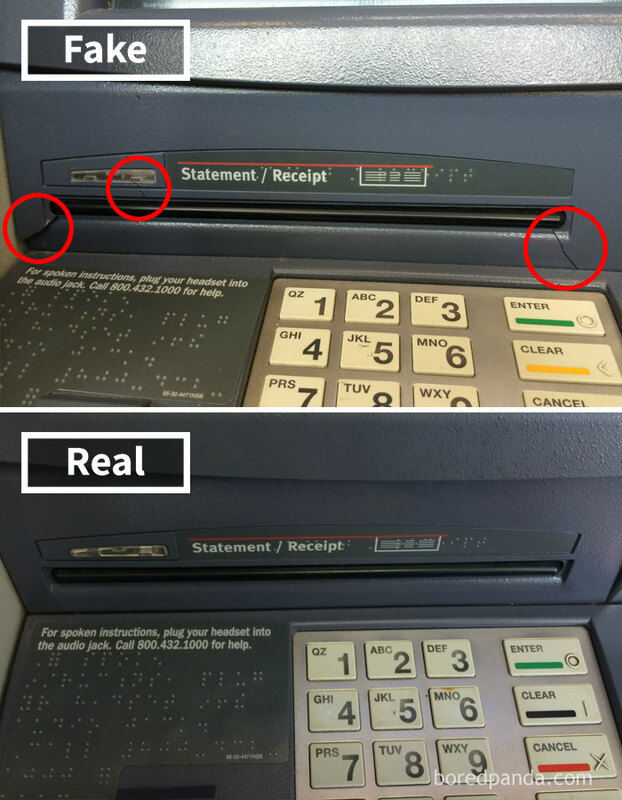 You can sometimes tell a fake before you even begin a transaction. 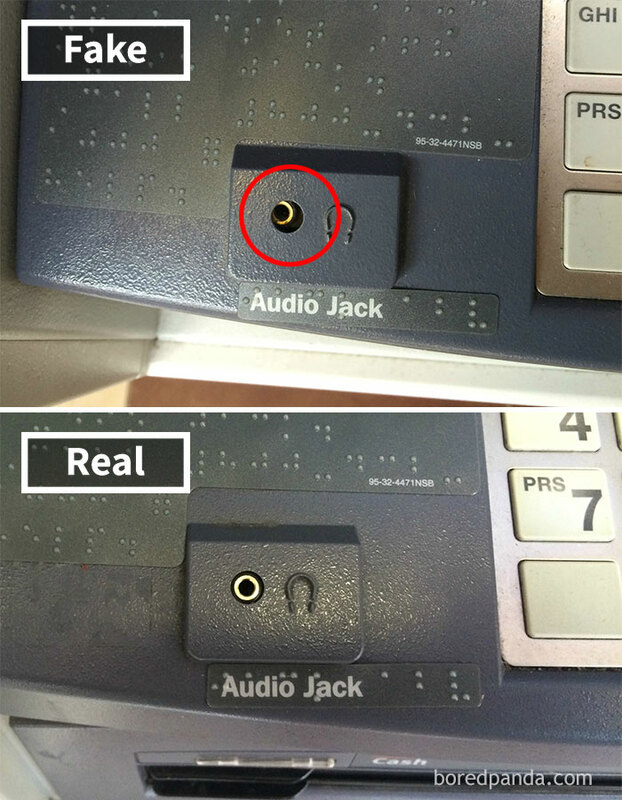 If you can’t tell by the card reader, you can check other components of the ATM such as the audio jack. As you can see, the fake one is covered a bit as if there is a plastic covering over it. You can see cracks in the plastic, showing that it is an overlaid piece of plastic for stealing card information. Scammers have even gone to the lengths of faking the cash slot. 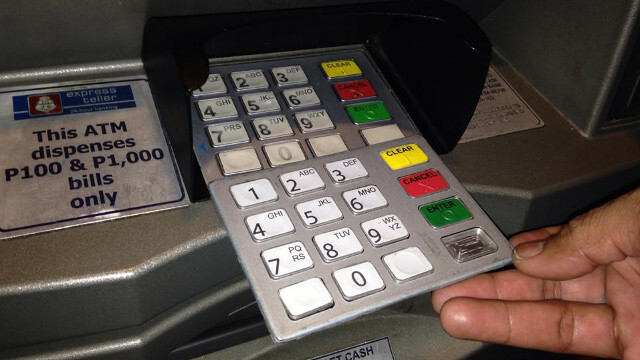 The fake cash slot makes it impossible for the user to receive their cash, and stores it inside the fake for the scammer to pick it up at a later point. 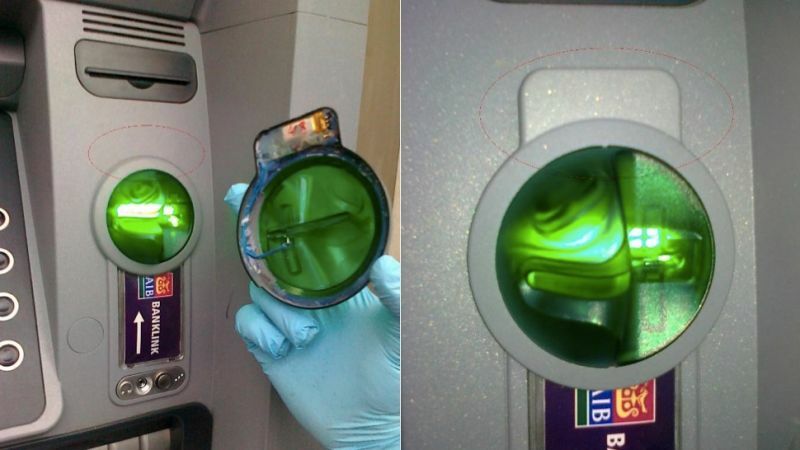 Scammers can easily change the colors and shapes of skimming devices to fit the ATM they are scamming. Don’t let these fool you. 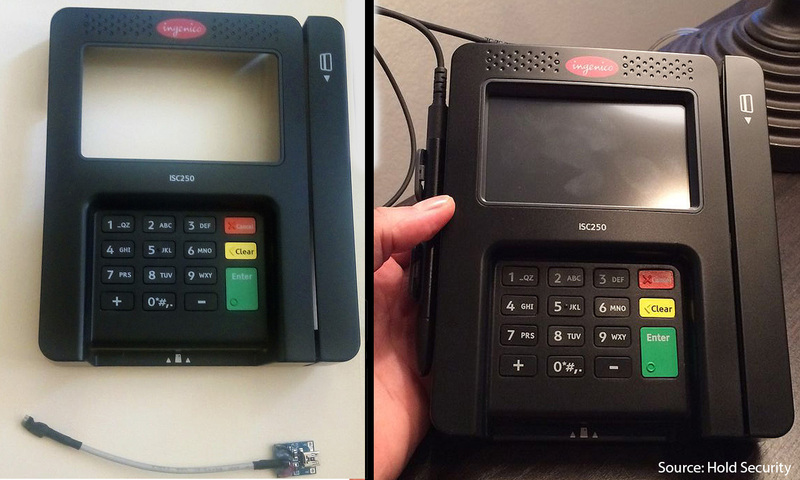 Skimming doesn’t stop at credit card scanners. 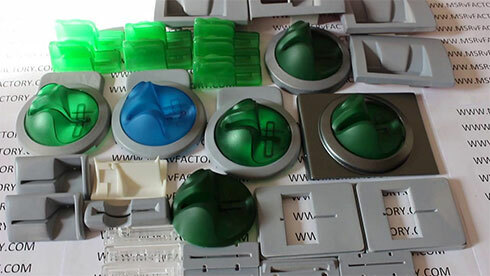 Watch out for fake key pads. 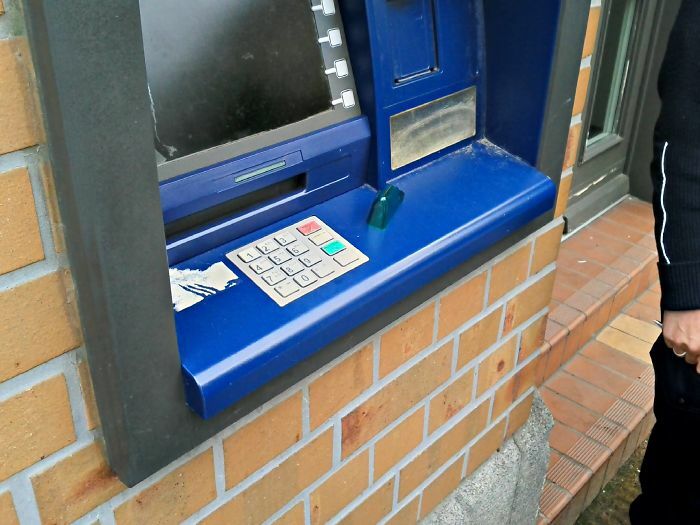 A good way to diffuse this skimming device is to try lifting the keypad. 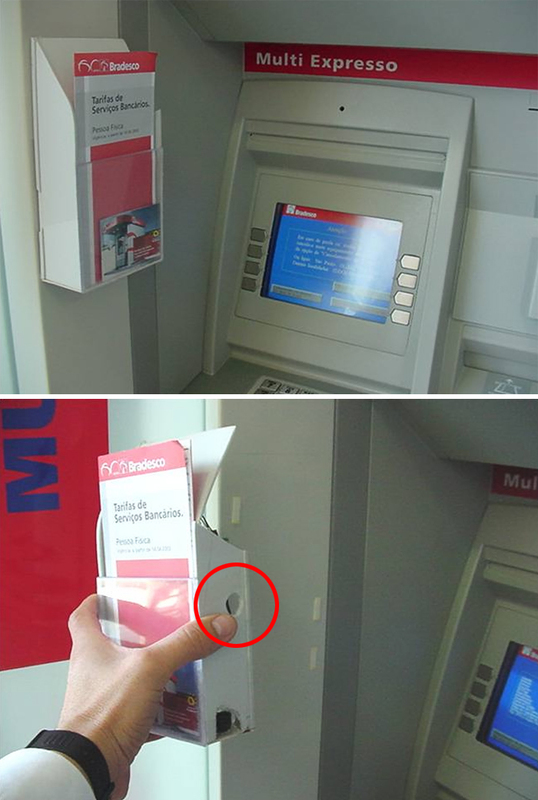 The panel underneath the ATM detached revealing a hidden camera. 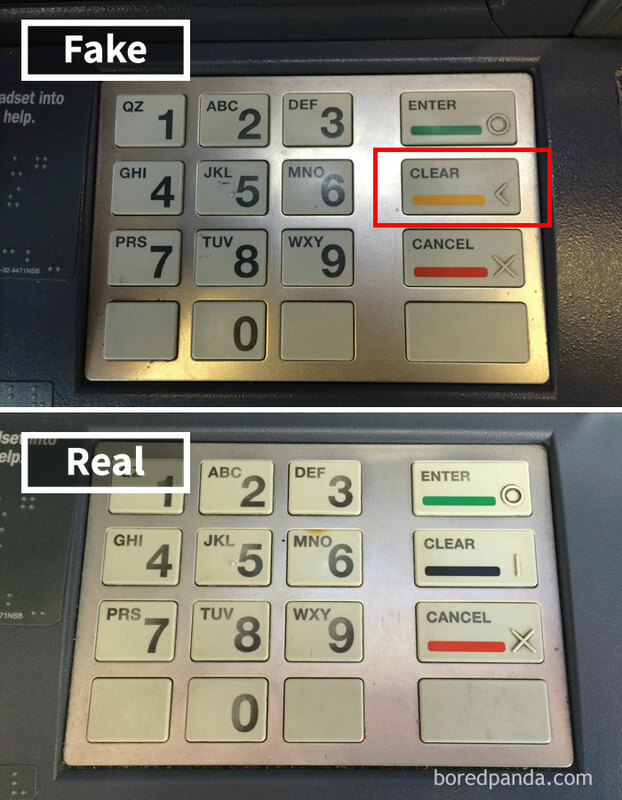 Change in button colors can indicate a fake keypad. 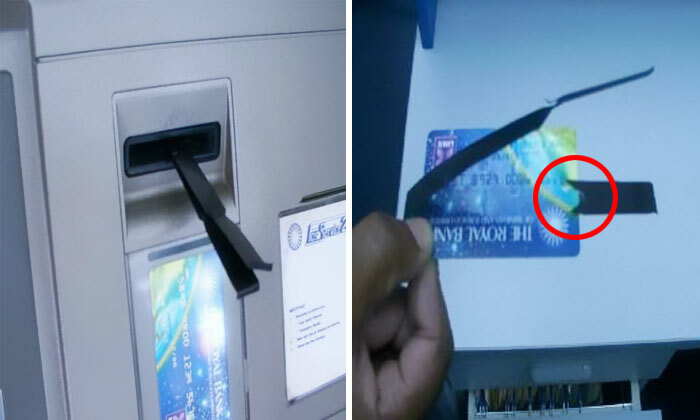 This device titled “Lebanese Loop” will prevent your card from being returned to you. 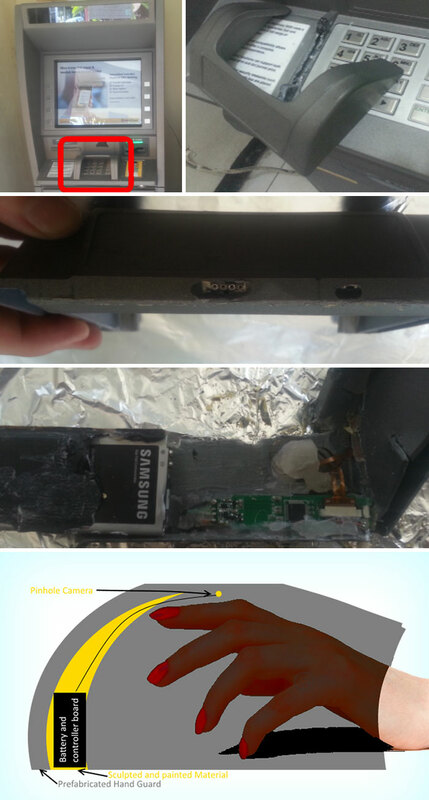 Scammers implant cameras in practical places that easily capture credit card and PIN information. As you can see they use microSD cards to store a lot of data in small amounts. Scammers take to great lengths and start putting cameras in weird places such as a brochure container. Sometimes scammers will combine the efforts of other scammers and create skimmers like seen above. 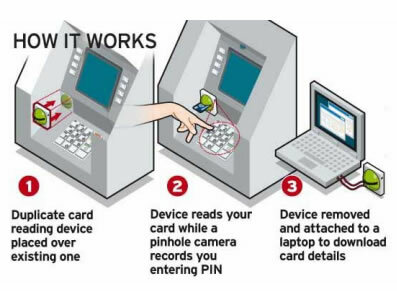 This kind of skimming device is small and simple for a scammer to retrieve and import information straight to their personal computers. 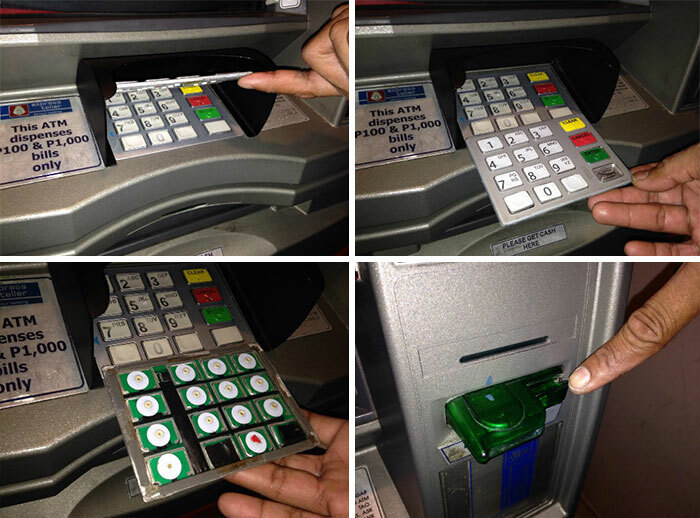 Scammers don’t just hit ATMs to steal your card information, they can go to means of faking keypads at convenient stores and more. 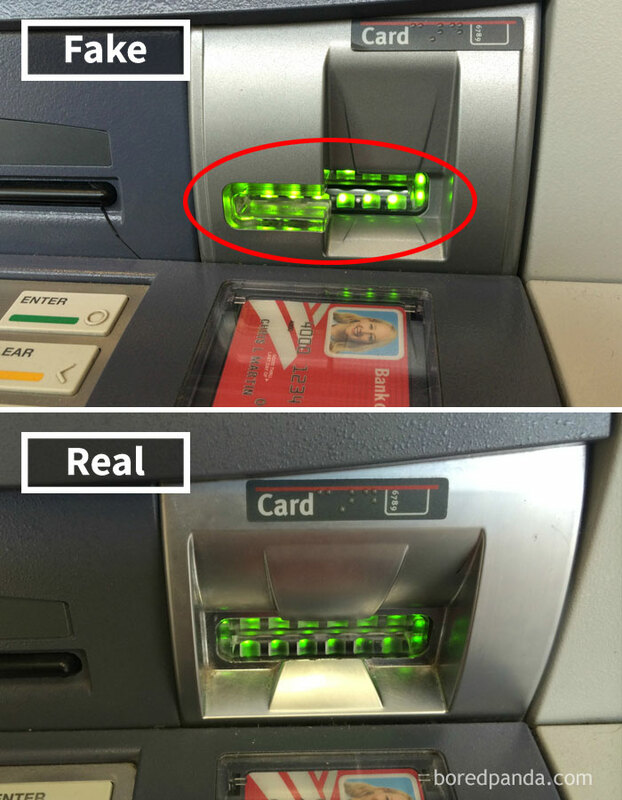 Lets just replicate the whole ATM, nobody will suspect a thing.